This Roundtable presentation will focus on how people change their stories and therefore their perceptions about death and dying. 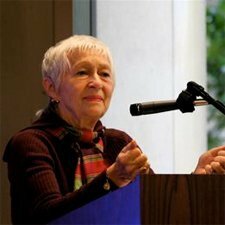 In her forthcoming book, An Insistence on Life: Releasing Fear of Death to Fully Live, Gignoux refutes the commonly held--though scientifically disputed--dualistic world view, where life is based solely on competition; where when one person (or theory) wins, the other must necessarily lose. Her book provides stories, drawn from her 30 years experience, about how the fear of death motivates too many of our everyday decisions. As a storyteller, Gignoux is a firm believer that while you cannot change what happened, you can change the story. Come hear how when people change their stories they change their life perceptions, their interactions and their choices. Jane Hughes Gignoux, a native New Yorker, is a storyteller and in addition to her upcoming book, is also the author of Some Folk Say: Stories of Life, Death, and Beyond, (FoulkeTale Publishing, New York, 1998). Her work centers on helping people change their “story,” through workshops, courses and other presentations sponsored by colleges, universities, hospices, hospitals, churches, community groups and Federal prisons.